Military Relocation also known as Permanent Change of Station (PCS) is just a part of the normal process of serving the country. At Blackbird Realty and Management, Inc., we understand the sense of urgency and stress that arises with changing stations. As a retired air force member, I have been through this many times myself and will do all I can to minimize the stress and uncertainty of the move. Blackbird Realty and Management, Inc. is devoted to making the move easy for property owner or tenant whichever the case may be. If you’re the property owner, we will keep your house in top condition and if you’re a tenant, you can expect a quality, well maintained home for you and your family to live in while you serve and protect the nation. 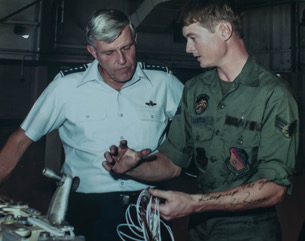 George Trombley – Retired Air Force Aircraft Maintainer, commonly known as the Crew Chief. 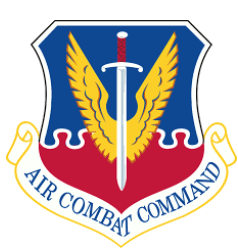 Served in the Strategic Air Command (SAC), Tactical Air Command (TAC), Air Defense Command (ADC), and the Pacific Air Command (PACAF). 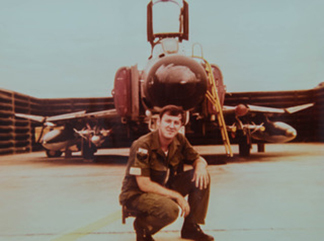 After retirement at Nellis Air Force Base, he got interested in Real Estate Property Management because it was very similar to aircraft maintenance. 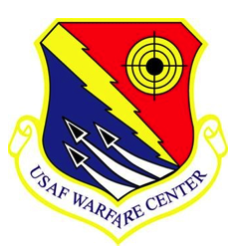 Even though your house will never be inverted at 30,000 feet and being fired on by other houses, it will be tenant occupied and will have issues that must be resolved. George started his property management career in 1991 working at White Owl Realty, with a small portfolio. He did some of the handyman maintenance himself in the very beginning. As his portfolio grew, the amount of time he had for the handyman maintenance dwindled. In 1994, George opened his own company which today is Blackbird Realty and Management, Inc. All the maintenance is now performed by licensed contractors whom are all vetted to make sure they are properly licensed and insured. Over the years, we have managed hundreds of homes just like yours and still do. We hope you enjoy the following picture of George when he was skinny and still had brown hair. Mark Lister – Air Force Veteran who has been in real estate sales and management for over 18 years. Mark served in the United States Air Forces Europe (USAFE) and at Nellis Air Force Base and has been with Blackbird Realty and Management, Inc., since 2011. He was a weapons specialist who spent many years on the Nellis Flight Line. Many of the properties in Mark’s portfolio belong to military members who have left the area. We hope you enjoy the picture of Mark when he was much younger and had buff. Notice that he is talking to 4 Star General Russ who happened to be the Tactical Air Command Commander at the time of the photo. Hooyaa! When you receive permanent change of station (PSC) notification or orders and are transferring to a new location that will take you away from the area, have a professional like Blackbird Realty and Management, Inc., manage the investment. Plenty of owner’s think that they can have a friend handle the rental for them but here are some things to consider. Professional Managers are regulated by State Law and are insured and accountable. Friends are not regulated and can actually be fined for managing without a license. Friends will not be required to obtain continuing education in order to remain your friend, but your property manager will be required to obtain continuing education to be your property manager. Friends will not be able to do credit checks or get criminal background information on prospective tenants unless that hire a private investigator (PI). Property Managers can run credit inquiries and can obtain criminal background checks. Friends will not have the expertise needed to deal with the non-paying tenant. Property managers deal with non-paying tenants regularly and can enforce the terms of the lease. Your home becomes an investment and can be part of your retirement if handled correctly and will need a professional to watch over it. I will share a story about a young marine, who bought a home at every duty station he was at. His first purchase was back in 1969, shortly after he received orders. He followed the advice of the loan officer who worked his loan and that advice was to hire a REALTOR® or property manager and not a friend if you get transferred. He followed that advice and over his career purchased a total of 8 houses and augmented his income along the way. He made an additional $90 per month from the first home, which in 1969 was a lot of money for a sergeant in the Marine Corp. Minimum wage in 1969 was $1.45 an hour. The additional money allowed him to buy a better house at the second duty station. When he moved to his third duty station, he sold the first home and used the equity to put down a sizable payment on his third house. At the end of his career, he had 7 houses that were totally paid off. He sold them one at a time and had more than doubled his money on each investment. He retired and moved to Las Vegas and bought newer homes in the community and paid cash for them and even though he is here and retired still has a manager who takes care of his property. Houses appreciate in value over time and are a great way to attain wealth.